Greater Manchester, Stockport and Cheshire. For the individual child, young person, school, and family. Call on 0781 363 7013 or use the contact form. We passionately believe in applying psychology to help children and schools thrive. Footsteps Psychology is passionate about three things: 1. Psychology 2. Education 3. Finding the difference which makes the difference for young people. This is why as a Child and Educational Psychology service we believe we’ve got the best job in the world! Footsteps’ mission is a simple, yet powerful one: ‘applying psychology to help schools, children and young people thrive’. We don’t compromise on this and make sure everything we do helps a young person or school. 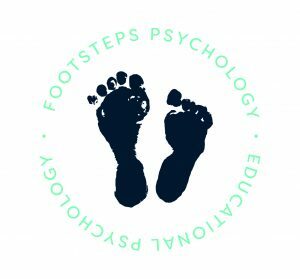 Footsteps Psychology was established in 2017 by Dr Jude Joughin with the aim of providing a bespoke and high quality Child and Educational Psychology service to schools and families. Our range of services covers assessment, intervention, whole school work and training. Footsteps Psychology draws upon both Jude’s and partner psychologists’ expertise and where relevant, enables collaboration and joint working with our partners. We are driven by our uncompromising belief in equality of opportunity for all and believe in providing a collaborative and flexible service in partnership with schools, families and all those we work with. To simply apply psychology without understanding a context would be like judging a book by its cover, hence at Footsteps we actively seek work in partnership with schools and families. This ensures that solutions and strategies are relevant and meaningful. We provide expertise at a systemic, group and individual level through collaboration and delivering psychology that is compatible and purposeful.